So, I'm no longer a big fan of long winded reviews and I don't even want to write a review, I'm just going to post my personal experience with these AZ Sartori. To post a review, I feel like you need to be some sort of an expert with that particular unit and I don't claim to be an expert in anything audio. If you're looking for a DK review ( @DarqueKnight ), stop reading. I was a cable non-believer forever. FOREVER. No amount of poking, prodding, or name calling on this forum would have me believe otherwise. 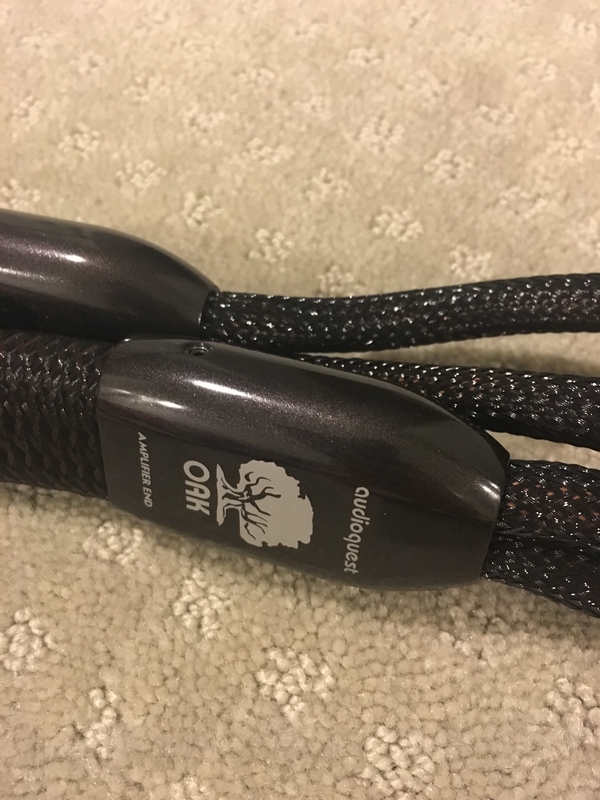 Then one day, I heard Audioquest OAKS in my system... and it changed my belief system. Later on, I saved my pennies and landed Audioquest's best speaker wire, current model AQ WEL Signature. My piece de resistance, so to speak. Since then, I've been interested in cabling, but I'm not really in the mood to try other megabuck brands... it is very difficult to bring in multi-thousand $ cables to test out without a local dealer though I know cable company can do loans though I have not explored it nor do I have any interest to improve on my WELS. I have been getting PMs in the background, Skip has offered Wild World, etc. But @WagnerRC (Bob) was insistent on sending me some AZ cabling... so I obliged. The reason is because if I audition a cable brand, I need to know that I can be comfortable affording their best units.... I don't want to audition a brand and not be able to buy their top cables. WW is just too expensive when you get up there, for example. Another reason why I'm not interested in hearing Nordost's Odin2 or Transparent's Opus line. 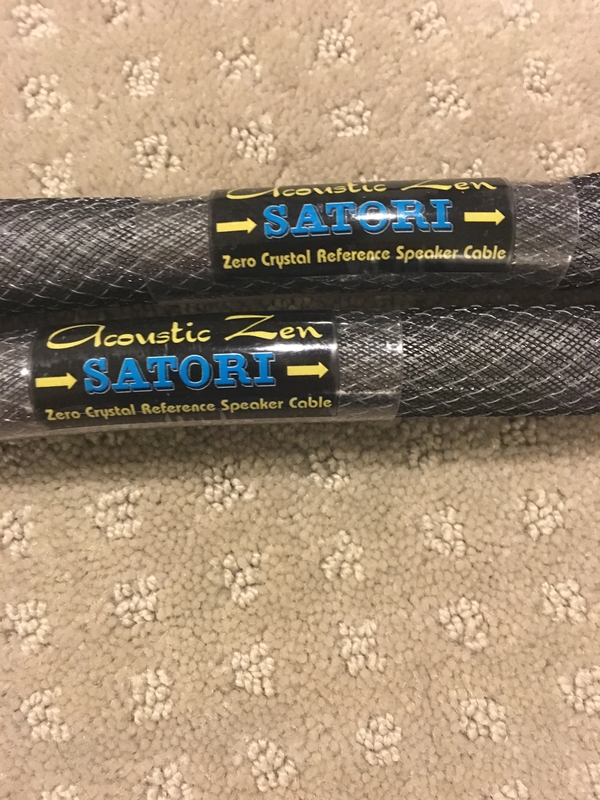 When I got them, it came in a bag that was labeled Acoustic Zen. It also detailed the model of the wire, length, terminations. Mine were Sartori, 6 ft, spades, full range wiring. The wire is pretty hefty, I tried to look at the internals through a peek inside the termination end near the heat shrink, it looks like 2 wires within an expandable and pliable white matrix. Not sure what that is. The spades are pretty thin, appears to be gold plated, but appears to be strong... no bend to them. The wire was pretty malleable, moreso than the AQ Tree series wires. There was this mesh over the cylindrical jacket. Not sure if that's just cosmetic or what.... but I think it adds a little flare to the speaker cable. I have 3 wires in my system. 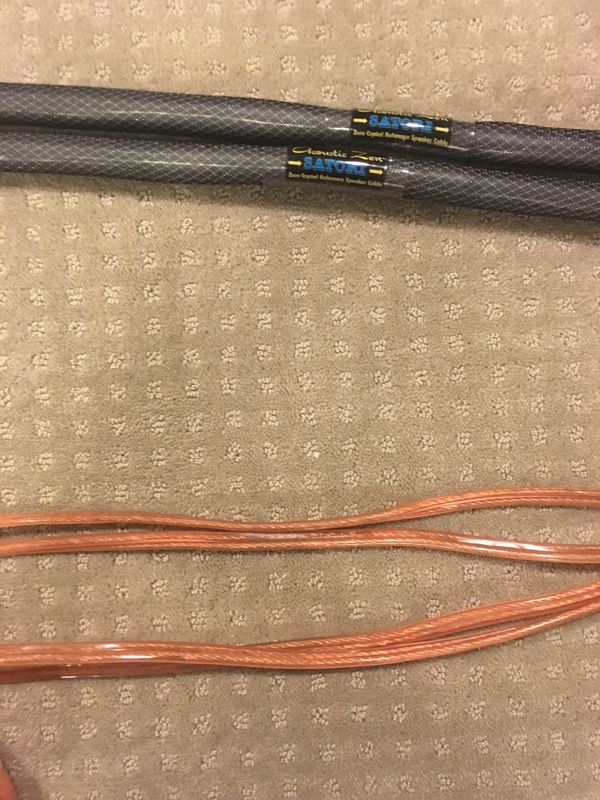 My stock 12g OFC wire that I made myself years and years ago when I still had Martin Logan Summits... and I have my friend's Audioquest Oak and my own Audioquest WEL. I plugged in the Sartoris into my system and I would a/b it against all 3 wires. I listened to a few songs on each one. My Boulder 2060 has the ability to biwire.... so it made it easy to flip and switch. My speakers have the ability to biwire as well, so it was an easy connection to make. 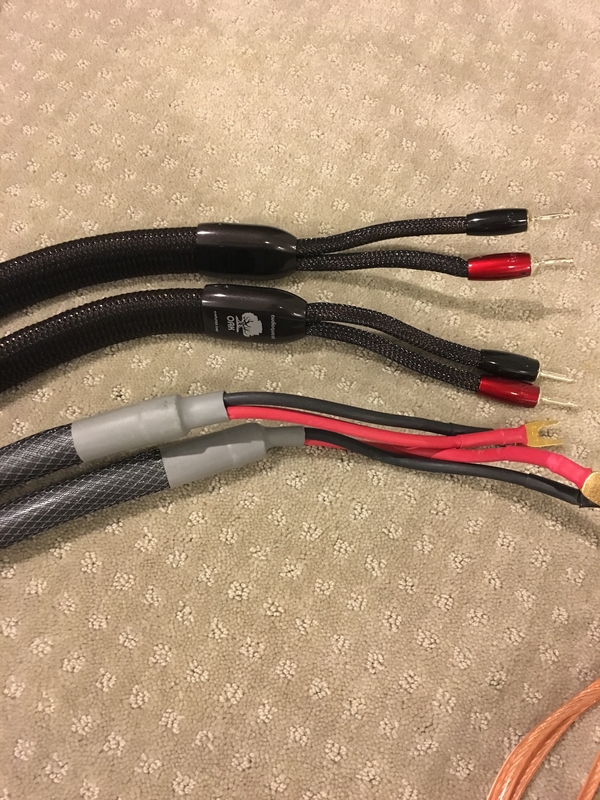 Of course, I had to disconnect one set of speaker wire at a time so as to not screw up my equpment. I think I had the Sartori for about 2 weeks, and I listened intermittently through that period of time. Keep in mind the pricing of each speaker wire. You can google the pricing for all 3. The Sartori's are the cheapest, the Oaks follow, and the WELS are nuts. I was very fair during the comparison, I leveled the loudness/db and I tried my best to eliminate expectation bias. I was actually hoping the Sartori was as good as the WEL because that would be a win win to me... I could sell the WEL and buy the Sartori and then pocket the cash or buy other gear that I was eyeballing. So, I plugged in the Sartori first, listened and got a general idea of what it was like. Then I plugged in the standard 12g OFC, then back to the Sartori, then I did this a few times, then I popped in the Oaks, then back to Sartori, then back to Oaks a few times, then back to OFC, then back to Sartori, then back to Oaks, then back and forth. In the end, I plugged in the WEL. The Sartoris sound pleasant. I think the sound pretty good for the money. They take the OFC sound and tweak it a little. Instead of running on for paragraphs, let's break down the sound components. Imaging - I would say the imaging on the Sartoris are pretty good, the singer is believable infront of me, I find the imaging to be a tad high however, like perhaps 6-12 inches taller than where I want them... similar in terms of imaging height (of the singer) as on the 12g OFC wiring. However, in terms of front to back imaging, it was similar or nearly a wash with the 12g OFC. Palpability, density of sound - I think this is where it really pulls away from the 12g OFC. Palpability is improved, perhaps bettering the 12g OFC by about 25%. Cleanliness of the sound - otherwise known as blackness between notes. I felt like this was another aspect that stood out and one of the first thing I noted. The music is presented in a much neater fashion than on the 12g OFC. There is less hash to the overall sound... but this was also a weakness.... read on. Tone - I thought tone was not it's strong point. I felt like because of how clean it made the sound appear, it also robbed it of tone, leading edge notes, overtones.... things just sounded like they got cut off prematurely. To illustrate, take the piano, the sound emanating from the system through the Sartori had all the notes, it was clean, staging was believable.. but the cleanliness of the sound just made it feel.. for lack of a better term.... reproduced. The 12g OFC has a rawness to it... sort of like a garden hose without a nozzle.... everything is just spraying everywhere and every which way... which can be a bad thing, but also a good thing when considering I get to hear a more lively and believable presentation of the piano along with the overtones, etc.... the notes hang and continue for period of time. Just to make sure I was not crazy, I plopped back the AQ Oaks. Immediately the piano sounded better, much better. The overtones were back, the notes just had a natural decay (rather than a premature cut). The whole thing just sounded better. Bass - I thought bass was a little lean on the Sartoris. Not to say it was thin sounding, but it was comparable to the 12g OFC. The Oaks pulled away without a shadow of doubt. I would listen to multiple cuts of music, pause it in the middle of it, switch out the wiring and press play. The bass notes were significantly more everpresent in the AQ Oaks than on the Sartori... piano sounded more like a piano down to the lower registers. Hash - definitely, as suggested earlier, a strong suit. Vocals had less hash than EVEN on the AQ Oaks, which was surprising to me, given the OAK is PSC+ (perfect surface copper+) in a counter spiral geometry with DBS.... I mean this was the best full copper wire in AQ's arsenal. 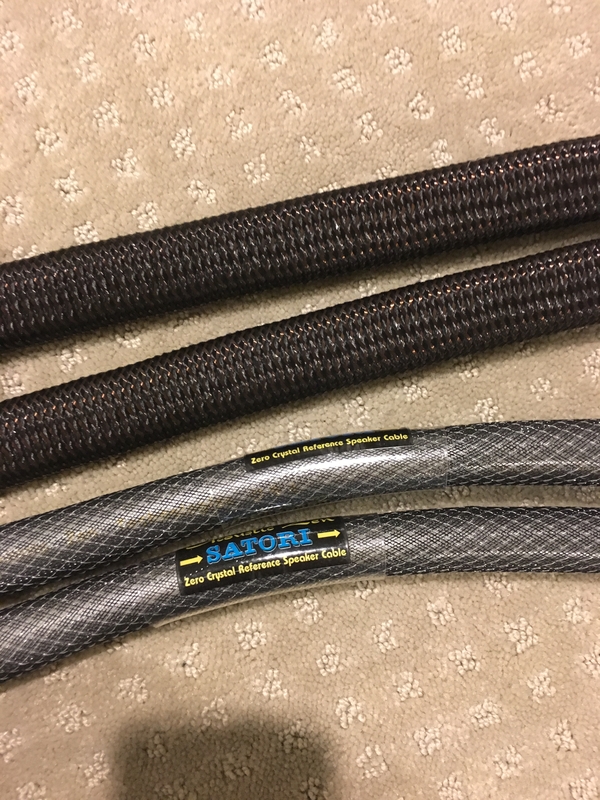 I think the Sartori is appealing, the price is good, and there are some benefits over stock wiring. The Sartori to me, was not as good as the Oaks. Nowhere near the WELS. The real estate between the Sartori and the WEL, in a high optimized system that has been fitted into a dedicated listening room with treatments is massive. There is just no way around it. Where the AQ Oaks beat the Sartori is in tone, soundstaging (denser image, lower and more inline with mouth height of singers), better front to back staging, better palpability, and better tone... tone tone tone is just right on the Oaks in my system. Where the Sartori beats the OAK is cleanliness of sound, less hash in the singer's voice. And obviously price point. But insert the WEL, and there's no contest. The OAKS sound inferior by a large amount to the WEL. The tone is better, the soundstage is clearer, more believable with better individualization of instruments AND blackness between notes and intruments, the density is FAR FAR better, the staging is just right... pulls the mouth of the singer down to where the mouth should be. The front to back is better as well. The bass is prodigious, the midrange is to die for, the highs just travel to the ends of their limits without strain. And the WELS have no hash compared to either the Oaks or the Sartoris, the voice is clean but without loss of overtones and rawness to the music. Listening to the Sartori, I get the image that the singer is right infront of me, but just a smidge tall, the palpability is there, but not dense enough to say I can cut it with a knife. The piano is to the left, the sound is clean, but with less overtones and with less bass than I would like. The music sounds good, very non-fatiguing and very enjoyable. I plug in the OFC and I get a good amount of what I hear on the Sartori but with less control. Imaging is similar and density is slightly less. The piano reverberates in the hall however. I plug in the OAKS and I get everything the Sartori does but into the next level, everything is clean, imaging better, density better, front to back better, the piano sounds engaging and fills the hall. I get a slight bit of hash however in her voice.... but still very good. I plug in the WELS, and there is no mistaking it. This is world class. Just my 2 cents. I would like to give special thanks to Bob ( @WagnerRC ) for allowing me to experience the AZ. Thanks for sharing your review. I enjoyed reading it and found it informative. I can only aspire to owning the AZ cables and will never step up to the level of cables you have. Thanks for sharing Joey. What would have been even better is having your audio buddy switch the cables randomly while you wore a blindfold. 12g OFC and Sartori, I would get it right > 50% of the time, it would be much better than chance. 12g and OAK, I would get it right > 75% of the time. 12g vs WEL, I would get it right 100% of the time. Nice review, and to the point. 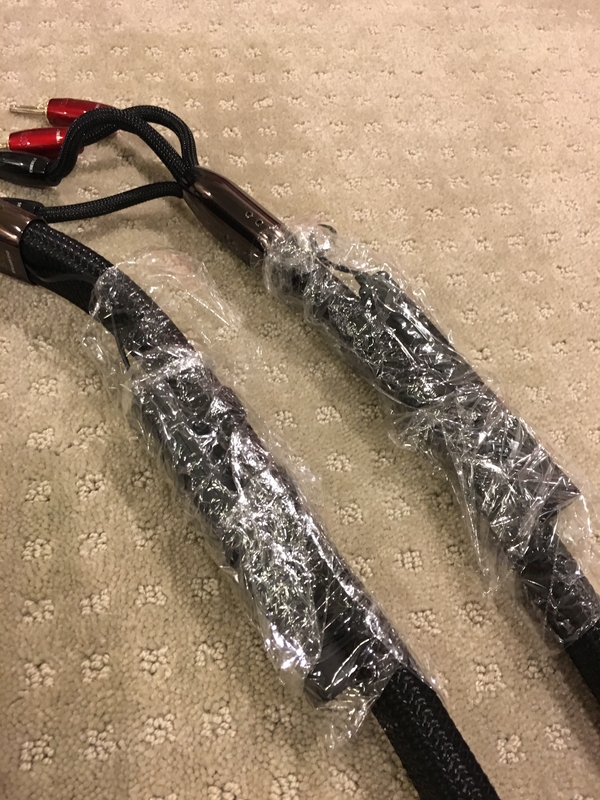 I'm fortunate enough to have a dealer close by that will lend me cables, and it is well worth it to borrow them. I find the difference you notice with cables is very system dependent and does have a point of diminishing return. Seems once you get to a certain point you have to spend a lot to get a little. I am fortunate enough to have demoed some pretty dam expensive cables in my system, for my budget. I do find they work best with each other as well. Love to try it against wire 5 or 600 times it's cost just for giggles, it's that good. Not a cable disbeliever either. nice work Joey! Thanks for sharing. I appreciate the well written, organized thoughts. I, too, would have liked to have seen what the results would have been with a blind switching. I'm a little disappointed you chose to totally ignore the wire coat hanger from lightman. In my place in life I've accepted that unless I hit the lottery I'm not spending asking price for most brands TOTL cables. I realize you stole the Wels, however, that's still more than I'm comfortable spending. 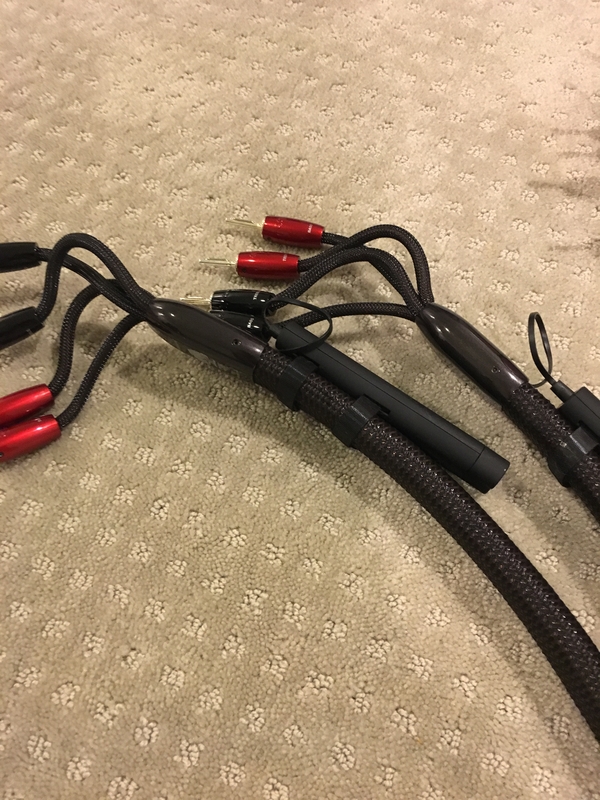 I was hesitant to pull the trigger on WW Equinox cabling, afraid of what I was getting myself in to. 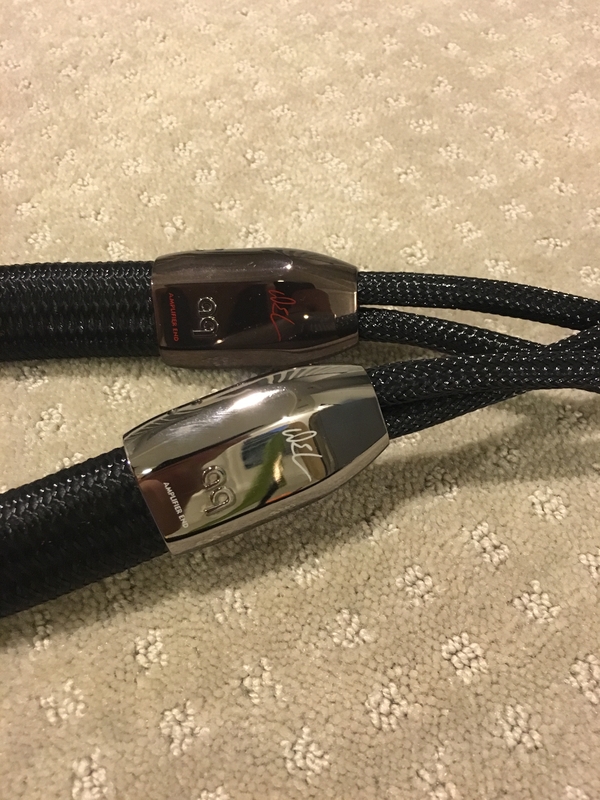 Having experimented with lower levels of some of the popular makers I had yet found a cable that really made me think there was more than a few cents difference between them. I took Skips advice, somewhat, and moved up a step or two above his suggested entry point. I immediately recognized that he was right. I'm now wishing I'd have doubled my investment in the speaker cable side and went with the Silvers instead. I did, however, find a level that I can recognize a return on the investment. My intentions are to move these to the secondary system over time and step up as resources allow. And the journey continues. As someone once said "it's not the destination that really counts, it's the path you travel in getting there that really counts." "Techflex" is the name of the jacket covering the wires. It was originally marketed to the automotive world to protect wires. It is available in 65987903245097238 different colors, patterns, sizes, etc through many vendors and eBay. Only somewhat related to your post but, as the Joes say, "And knowing is half the battle. GO JOE!" My take on this review, as we all keep saying, is the quality of the cabling needs to improve as your electronics and speakers improve. Something many never consider. Good review Joey, and we'll consider that a Christmas present. Speaker and inter-connect cables are important, as you found out. Good for you. Overcoming a bias is part of maturing. However, for me, power cables, and power conditioning, has given me the biggest bang. Literally, going with TOTL Shunyata power products on my gear was a major component upgrade in performance. You do not realize how much grunge is in the music until it is gone. After the holiday break I will be sending both of my Tritons (stereo and HT) back to Shunyata for a v3 upgrade. Can't wait to start the new year with even better sounding music. If price is enough to sway your ears,you are in the wrong hobby. 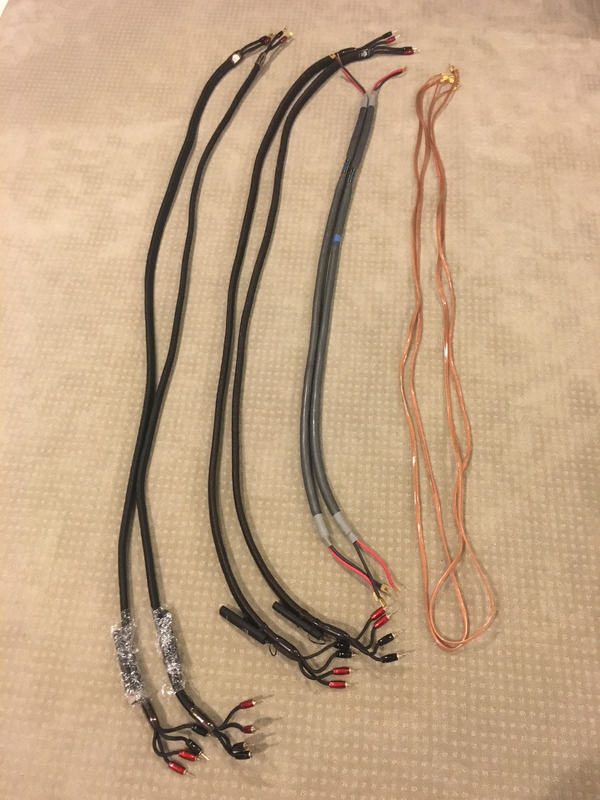 I've had dozens of cables in my rig and none could outdo the PNF ($100 used, $240 when new), until I brought in the Wireworld Equinox at a list price of $750. Other competitors ranged from $50 to $5000 list price. Literally seconds into the first session with Wireworld I knew I had found a new reference set of cables. Dang X, we all get your grievances with cables, well noted, but must you keep mucking up cable threads ? The only research and technology needed is what your ears tell you. what Tony said: can't you stop mucking up a thread! Joey did a review and you just have to walk on it? Thanks Joey for the Review & and taking the time to share with us your thoughts and like! sounds like you had fun that is what it is all about. ENJOY! Same here skip. Not to belittle any other brands, or anyones personal listening tastes, but I knew within seconds of listening to the Equinox on my system that something told me I was in to something good. I had higher hopes but low expectations. I fully expected to have to deal with a few days of nonstop running in for them to open up. Was completely and pleasantly surprised with the way my system sounded. I had thought that more than likely I wouldn't hear enough of a difference to justify the price and would sell them for half and chalk it up to a lesson learned. Instead I came back for more...like a junkie. Same tired arguments from the same tired people. These are Joey's observations and the naysayers, please respect the thread and poster. If you have issues, start your own thread and debate away. It's rude to muck up a review thread, which is all it is, nothing more nothing less. Why you (naysayers) think your arm chair analysis has any merit in this thread, I'll never understand. You weren't there conducting your own side by side review, so you should probably STFU! Read the thread title "My personal experience"
+1 to H9's comments. It gets old and derails the thread. Nice review Joey. In the end, it's about your ears and preference. Thanks for the review. Very interesting. My only experience with AZ is with interconnects and they're definitely keepers. I don't understand your audition criterion above though. Many stellar cable manufacturers have Ludicrous Price lines. Why eliminate from consideration all cables from some of the best manufacturers based solely on the price of their top level pricing? I can understand wanting to limit the universe of products to consider, but this method seems arbitrary and possibly even counterproductive. Nice honest review! We appreciate the time you took to write it up. Given the cost of the Oak, I think a fair fight would be against the AZ Absolute since they are in the same price range. He posted his approach to this hobby in the Emma's Speakers thread. I respect Joey in that he knows what he is after and it isn't always the best sound he can afford. Admitting that to a rabid forum takes some serious gonads. Nice job Joey. Thank you for taking the time to share your thoughts here. It is appreciated. Upon blowing up the pics the sartory look like a garden hose literally. I like that you still kept the trusty old 12awg around. Because that is what you were used to for so long. Leave out the sound quality just the familiarity of what to expect when listening to your favourite cds. I would think being able to pick out major and subtle differences would be easier seeing you still were able to use them. I would be interested in blinding myself and posting my findings. But I would want to blind myself in a certain manner. I would like to have 1 song, 1 pre-procedure listening session/30s clip unblinded, then blind test me. 2 cables, ofc vs wel. Blind a/b testing is for weak minded people. A strong mind, would not be afraid..........nor call names, nor try to make excuses. "Nobody disagree with me....I am never wrong.!" No disrespect intended, but you are arguing you are right, just cause you say you are right......Next step is usually back up a choice or thought with more concrete proof. I can relate to your view in a way though. But eventually someone will Pull the rug out from under you.......just wait and see! Well no, it is you proclaiming there is only one way using a test that has proven itself extremely unreliable and therefore inappropriate. Only a weak minded person would cling to that. Sorry I Never even mentioned Blind testing, nor said there is only one way..........you construed that from me asking a question of the OP. I asked how the OP removed bias from his testing, as he mentioned he did something to remove expectation bias. Are you saying, blind testing, does not agree with your assessments, therefore, it must be wrong?? ...........Since you brought up blind testing. Yes blind testing is unreliable as far as in regards to agreeing with a biased opinion, but I think that is the reason it is useful for determining an outcome that is more than a biased opinion. Attacking a test method cause it does not agree with you, could honestly mean you are not sure enough in your opinions or convictions unless you are aware of what you are comparing. You should go back and re-read what you wrote in your previous posts since you can't seem to remember it. In the meantime, try not to appear so wishy-washy. My befuddlement has to do with his approach to selection for audition as per his stated criterion; not his overall approach to the hobby. I've just never found myself eliminating a whole brand based on the stratospheric price of its highest priced item; so I'm having trouble relating. BMW makes a $400k car which I can definitely not afford. But I don't disregard all BMW's when considering what to test drive. The same reasoning might be applied to Aston Martin and Mercedes if you get my drift. We all have our own methods and journeys and I respect that. I try to learn from others' experiences, which is the reason I am reading here. But in this case, I just wasn't able to figure out how I might benefit from this particular criterion. I'm interested in any further comments Joey might have. So glad you mentioned the ONE song. To be able to discern differences in cables or gear for that matter, IMO, one would need to remember every or certain musical notes in a song and be able to somehow recall them and compare it to the notes currently being played. Is this humanly possible? Disclaimer, I'm at an early stage of my musical journey. It only requires familiarity. I have a handful of music is use for demo purposes. I know that material backwards and forwards and any changes I make in my own rig, I always play these 8-10 songs to evaluate. Things like decay of a cymbal, depth of background singers, position of background singers, notes of the bass drum, air around the vocals, plucking of a guitar string, soundstaging cues, etc, etc, etc. Once you have familiarity and know what to listen for the differences, minor and major, are easy to hear. Very easy, actually. One concrete example is when I installed a linear power supply vs. the switching walwart on my Logitech Touch streamer. I played several songs but on one song with the linear power supply I could actually hear the singer inhale on one verse, with the standard walwart it was almost impossible to hear him inhale on that same verse. There were all kinds of very subtle changes with the better power supply. If you don't know how and what to listen for you'll never get it.